Russia is all over the news lately. From the Sochi Olympics to the Ukraine uprising, from civil rights protests to the Syrian civil war, not a single day passes without the dominant and firm figure of Vladimir Poutin showing up on the media, smile-less as ever. This might be a subtle reminder of the somehow forgotten power of the Russian Federation, but there is more to Russia than its politics. There is its Language. 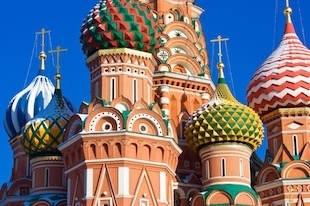 Needless to say that with over 140 million native speakers, Russian is one of the most spoken languages in the world. In fact, it is one of the official languages of the United Nations, and is adopted by 6 countries as their official language. But aside those boring facts, its History hides some interesting twists. Up to the 14th century, the main cultural and political center in eastern Europe was not Moscow, rather Kiev, a city that is clearly stating its independences from the growing Moscovite influence. At that time, people in Kiev and Moscow were speaking two dialects of the same language: Eastern Slavic and Old Russian language. Today, these dialects, along with Bielorussian, have become different languages. The political and cultural power shifting to Moscow contributed further to the evolution of the Russian Language. This was marked by the appearance of Polish and German words into the language, modifying it from the official state language, which was still old Russian. This era was then followed by an important wave of reforms initiated by Peter the great to standardise the alphabet and modernise the language. Blocks of specialised vocabulary were adopted from the languages of Western Europe. Most of the modern naval vocabulary, for example, is of Dutch origin. Latin, French, and German words entered Russian in the ‘intellectual’ fields. When finally the language reached its modern form, in the 19th century, literature flourished. Russian authors contributed significantly to almost all known genres of literature. Dostoyevsky, Chekov, Pushkin and many other talented writers contributed to what is known today as the “Golden Era” of the Russian literature, and also helped shape the language. Since then, Russian literature has become an important cornerstone of Russian identity. For example, as of 2011, Russia was the fourth largest book producer in the world in terms of published titles. Klara ukrala u Karla Korally, a Karl u Klary ukral klarnet. Na dvore – trava, na trave – drova, ne rubi drova na trave dvora. Yekhal Greka tcherez reku, vidit Greka v reke rak; sunul Greka ruku v reku, rak za ruku Greku tsap.